Carotenoids (/kəˈrɒtɪnɔɪd/), also called tetraterpenoids, are organic pigments that are produced by plants and algae, as well as several bacteria and fungi. Carotenoids give the characteristic color to carrots, corn, canaries, and daffodils, as well as egg yolks, rutabagas, buttercups, and bananas. Carotenoids can be produced from fats and other basic organic metabolic building blocks by all these organisms. The only animals known to produce carotenoids are aphids and spider mites, which acquired the ability and genes from fungi or it is produced by endosymbiotic bacteria in whiteflies. Carotenoids from the diet are stored in the fatty tissues of animals, and exclusively carnivorous animals obtain the compounds from animal fat. There are over 1100 known carotenoids; they are split into two classes, xanthophylls (which contain oxygen) and carotenes (which are purely hydrocarbons, and contain no oxygen). All are derivatives of tetraterpenes, meaning that they are produced from 8 isoprene molecules and contain 40 carbon atoms. In general, carotenoids absorb wavelengths ranging from 400–550 nanometers (violet to green light). This causes the compounds to be deeply colored yellow, orange, or red. Carotenoids are the dominant pigment in autumn leaf coloration of about 15-30% of tree species, but many plant colors, especially reds and purples, are due to other classes of chemicals. Two GGPP molecules condense via phytoene synthase (PSY), forming the 15-cis isomer of phytoene. The subsequent conversion into all-trans-lycopene depends on the organism. Bacteria and fungi employ a single enzyme, the bacterial phytoene desaturase (CRTI) for the catalysis. Plants and cyanobacteria however utilize four enzymes for this process. The first of these enzymes is a plant-type phytoene desaturase which introduces two additional double bonds into 15-cis-phytoene by dehydrogenation and isomerizes two of its existing double bonds from trans to cis producing 9,15,9’-tri-cis-ζ-carotene. The central double bond of this tri-cis-ζ-carotene is isomerized by the zeta-carotene isomerase Z-ISO and the resulting 9,9′-di-cis-ζ-carotene is dehydrogenated again via a ζ-carotene desaturase (ZDS). This again introduces two double bonds, resulting in 7,9,7’,9’-tetra-cis-lycopene. CRTISO, a carotenoid isomerase, is needed to convert the cis-lycopene into an all-trans lycopene in the presence of reduced FAD. Beta-carotene, found in carrots and apricots, is responsible for their orange-yellow colors. Dried carrots have the highest amount of carotene of any food per 100 gram serving, measured in retinol activity equivalents (provitamin A equivalents). Vietnamese gac fruit contains the highest known concentration of the carotenoid lycopene. The diet of flamingos is rich in carotenoids, imparting the orange-colored feathers of these birds. A 2014 review found no correlation between consumption of foods high in carotenoids and vitamin A and the risk of getting Parkinson’s disease. Microorganisms can be genetically modified to produce certain C40 carotenoids, including lycopene and beta carotene. ^ Moran NA, Jarvik T (2010). “Lateral transfer of genes from fungi underlies carotenoid production in aphids”. Science. 328 (5978): 624–7. doi:10.1126/science.1187113. PMID 20431015. ^ Nováková E, Moran NA (2012). “Diversification of genes for carotenoid biosynthesis in aphids following an ancient transfer from a fungus”. Mol Biol Evol. 29 (1): 313–23. doi:10.1093/molbev/msr206. PMID 21878683. ^ Sloan DB, Moran NA (2012). “Endosymbiotic bacteria as a source of carotenoids in whiteflies”. Biol Lett. 8 (6): 986–9. doi:10.1098/rsbl.2012.0664. PMC 3497135. PMID 22977066. ^ Yabuzaki, Junko (2017-01-01). “Carotenoids Database: structures, chemical fingerprints and distribution among organisms”. Database. 2017 (1). doi:10.1093/database/bax004. PMC 5574413. PMID 28365725. ^ Armstrong GA, Hearst JE (1996). “Carotenoids 2: Genetics and molecular biology of carotenoid pigment biosynthesis”. FASEB J. 10 (2): 228–37. doi:10.1096/fasebj.10.2.8641556. PMID 8641556. ^ a b Bernstein, P. S.; Li, B; Vachali, P. P.; Gorusupudi, A; Shyam, R; Henriksen, B. S.; Nolan, J. M. (2015). 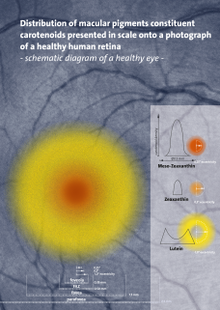 “Lutein, Zeaxanthin, and meso-Zeaxanthin: The Basic and Clinical Science Underlying Carotenoid-based Nutritional Interventions against Ocular Disease”. Progress in Retinal and Eye Research. 50: 34–66. doi:10.1016/j.preteyeres.2015.10.003. PMC 4698241. PMID 26541886. ^ a b c d e f g h i Nisar, Nazia; Li, Li; Lu, Shan; Khin, Nay Chi; Pogson, Barry J. (2015-01-05). “Carotenoid Metabolism in Plants”. Molecular Plant. Plant Metabolism and Synthetic Biology. 8 (1): 68–82. doi:10.1016/j.molp.2014.12.007. PMID 25578273. ^ a b c d e f g h i j KUZUYAMA, Tomohisa; SETO, Haruo (2012-03-09). “Two distinct pathways for essential metabolic precursors for isoprenoid biosynthesis”. Proceedings of the Japan Academy. Series B, Physical and Biological Sciences. 88 (3): 41–52. doi:10.2183/pjab.88.41. ISSN 0386-2208. PMC 3365244. PMID 22450534. ^ Moise, Alexander R.; Al-Babili, Salim; Wurtzel, Eleanore T. (31 October 2013). “Mechanistic aspects of carotenoid biosynthesis”. Chemical Reviews. 114 (1): 164–93. doi:10.1021/cr400106y. PMC 3898671. PMID 24175570. ^ Nisar, Nazia; Li, Li; Lu, Shan; ChiKhin, Nay; Pogson, Barry J. (5 January 2015). “Carotenoid Metabolism in Plants”. Molecular Plant. 8 (1): 68–82. doi:10.1016/j.molp.2014.12.007. PMID 25578273. ^ a b c d e Vershinin, Alexander (1999-01-01). “Biological functions of carotenoids – diversity and evolution”. BioFactors. 10 (2–3): 99–104. doi:10.1002/biof.5520100203. ISSN 1872-8081. PMID 10609869. ^ a b c Cogdell, R. J. (1978-11-30). “Carotenoids in photosynthesis”. Phil. Trans. R. Soc. Lond. B. 284 (1002): 569–579. doi:10.1098/rstb.1978.0090. ISSN 0080-4622. ^ Finkelstein, Ruth (2013-11-01). “Abscisic Acid Synthesis and Response”. The Arabidopsis Book / American Society of Plant Biologists. 11: e0166. doi:10.1199/tab.0166. ISSN 1543-8120. PMC 3833200. PMID 24273463. ^ Linus Pauling Institute. “Micronutrient Information Center-Carotenoids”. Retrieved 3 August 2013. ^ Simpson, K; Cerda, A; Stange, C (2016). Carotenoid Biosynthesis in Daucus carota. Sub-cellular Biochemistry. Carotenoids in Nature. 79. pp. 199–217. doi:10.1007/978-3-319-39126-7_7. ISBN 978-3-319-39124-3. PMID 27485223. ^ Campbell, O.E. ; Merwin, I.A. ; Padilla-Zakour, O.I. (2013). “Characterization and the effect of maturity at harvest on the phenolic and carotenoid content of Northeast USA Apricot (Prunus armeniaca) varieties”. Journal of Agricultural and Food Chemistry. 61 (51): 12700–10. doi:10.1021/jf403644r. PMID 24328399. ^ “Foods highest in Retinol Activity Equivalent”. nutritiondata.self.com. Retrieved 2015-12-04. ^ Tran, X. T.; Parks, S. E.; Roach, P. D.; Golding, J. B.; Nguyen, M. H. (2015). “Effects of maturity on physicochemical properties of Gac fruit (Momordica cochinchinensis Spreng.)”. Food Science & Nutrition. 4 (2): 305–314. doi:10.1002/fsn3.291. PMC 4779482. PMID 27004120. ^ Yim, K. J.; Kwon, J; Cha, I. T.; Oh, K. S.; Song, H. S.; Lee, H. W.; Rhee, J. K.; Song, E. J.; Rho, J. R.; Seo, M. L.; Choi, J. S.; Choi, H. J.; Lee, S. J.; Nam, Y. D.; Roh, S. W. (2015). “Occurrence of viable, red-pigmented haloarchaea in the plumage of captive flamingoes”. Scientific Reports. 5: 16425. doi:10.1038/srep16425. PMC 4639753. PMID 26553382. ^ Vieira, AR; et al. (Jan 2016). “Fruits, vegetables and lung cancer risk: a systematic review and meta-analysis”. Ann Oncol. 27 (1): 81–96. doi:10.1093/annonc/mdv381. PMID 2637128. ^ Leoncini; Sources, Natural; Head; Cancer, Neck; et al. (Jul 2015). “A Systematic Review and Meta-analysis of Epidemiological Studies”. Cancer Epidemiol Biomarkers Prev. 24 (7): 1003–11. doi:10.1158/1055-9965.EPI-15-0053. PMID 25873578. ^ Soares Nda, C; et al. (Oct 2015). “Anticancer properties of carotenoids in prostate cancer. A review”. Histol Histopathol. 30 (10): 1143–54. doi:10.14670/HH-11-635. PMID 26058846. ^ Takeda, A; et al. (2014). “Vitamin A and carotenoids and the risk of Parkinson’s disease: a systematic review and meta-analysis”. Neuroepidemiology. 42 (1): 25–38. doi:10.1159/000355849. PMID 24356061. ^ Sacchi, Roberto (4 June 2013). “Colour variation in the polymorphic common wall lizard (Podarcis muralis): An analysis using the RGB colour system”. Zoologischer Anzeiger. 252 (4): 431–439. doi:10.1016/j.jcz.2013.03.001. ^ Whitehead RD, Ozakinci G, Perrett DI (2012). “Attractive skin coloration: harnessing sexual selection to improve diet and health”. Evol Psychol. 10 (5): 842–54. doi:10.1177/147470491201000507. PMID 23253790. ^ Archetti, Marco; Döring, Thomas F.; Hagen, Snorre B.; Hughes, Nicole M.; Leather, Simon R.; Lee, David W.; Lev-Yadun, Simcha; Manetas, Yiannis; Ougham, Helen J. (2011). “Unravelling the evolution of autumn colours: an interdisciplinary approach”. Trends in Ecology & Evolution. 24 (3): 166–73. doi:10.1016/j.tree.2008.10.006. PMID 19178979. ^ Liu GY, Essex A, Buchanan JT, et al. (2005). “Staphylococcus aureus golden pigment impairs neutrophil killing and promotes virulence through its antioxidant activity”. J. Exp. Med. 202 (2): 209–15. doi:10.1084/jem.20050846. PMC 2213009. PMID 16009720. ^ “Biosynthesis of carotenoids”. Archived from the original on 2012-02-23.